Latest surveys have provided us an atrocious information that, these days, deaths due to domestic fire accidents have taken a giant leap, especially in India. Among the causes of such mishaps, LPG leakage accidents top the list. Though this issue is becoming more crucial with passing days, no exact remedial systems have been designed. The systems available in present day markets are capable of just alerting people in case of a gas leakage. But, so far, no systems have been designed to obstruct the main cause of the accident - the leakage. Now, when man has already set his foot on the other planets, and is planning to start a life there, the technology he uses must also escalate. This gave us an idea to develop a system to control the leakage at its onset. Like the existing systems, this system provides LCD, buzzer and SMS alerts. But the innovation of our proposed system lies in its ability to shut off the gas cylinder's regulator automatically. Thus the system takes the entire responsibility of providing the safety measures, while the user can just luxuriate. The prime motive of this system is to save lives. After all, LPG cylinders in households are to eliminate rawness, not lives. 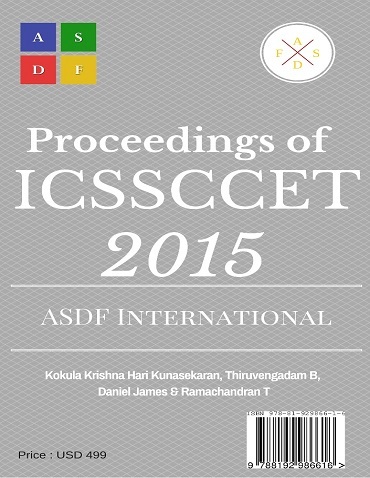 K KEERTHIVASAN, SARAVANA MANIKANDAN B, DEVASRRI P, ANURADHA R. "Gas Leakage Deduction with Auto Shut-Off." International Conference on Systems, Science, Control, Communication, Engineering and Technology (2015): 22-23. Print.